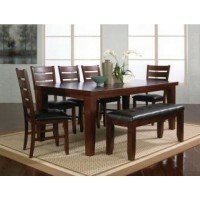 Includes: 1 Dining Table 4 Side Chairs 1 Bench Available in Counter Height INTERNET SPECIAL!!! Designed for larger families needing extra space for those memorable family dinners, Crown Marks Parsons 64" Rectangle Dining Room Group provides that needed comfort while losing nothing in style. 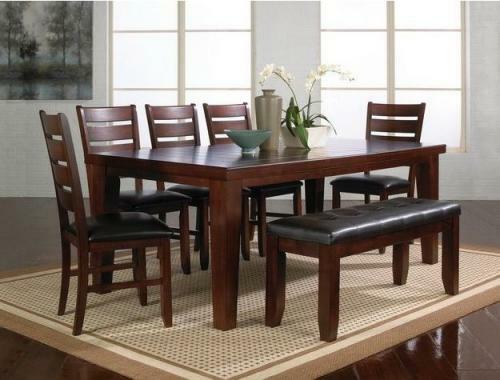 The rectangular parson's table with ladder back chairs and warm cherry finish give this group a style all its own. The 1-18" leaf gives this table some added length, measuring up to 82", perfect when expecting extra company. Designed for comfort and fashion, this group is a must have for any larger family. Group comes complete with table, four chairs, bench, and server.